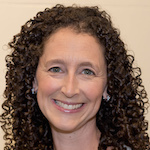 Miriam Cohen, PT, DPT, PCS is a Board Certified Pediatric Physical Therapist. She graduated with a Doctor of Physical Therapy from Duke University and has an undergraduate degree from Northwestern University. Miriam has been a physical therapist for over 13 years. Miriam has practiced pediatric physical therapy in a school, rehabilitation center, early intervention and private practice. Miriam’s pediatric experience includes a wide variety of neurological, orthopedic and congenital issues resulting in movement impairment. Miriam has extensive training in respiration retraining and the interdependence between breathing and trunk strength. Miriam also has training and skills with teaching yoga to children which she often incorporates into a treatment plan. Miriam prides herself in her open communication with both families and doctors for the benefit of the child. Miriam is a member of the national and state chapters of the American Physical Therapy Association (APTA) and the Pediatric section of the APTA.. While not working, Miriam spends her time with her husband, son and daughter. She enjoys practicing yoga, running, riding her road bike, skiing and being outside.